.Guest Post | One Nail to Rule Them All. I’m really excited to share this amazing manicure with you courtesy of Alice from One Nail to Rule Them All – my first ever guest post and it’s an adorable one at that! Keep reading to find out just how to create this sweetie pie manicure from the expert herself! ‘Hey everyone! 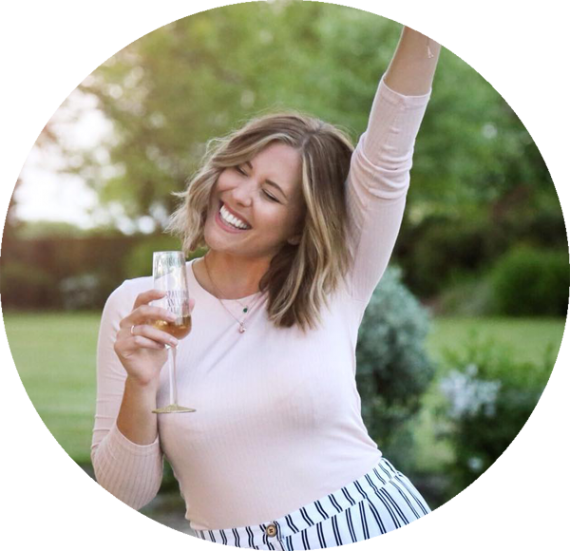 I’m so honored to be here on Amelia’s blog, I absolutely love her posts and even though I’m just a nail blog I make the effort to read all her posts (maybe 99% if I happen to miss a day, but still!) whether nail related or not. 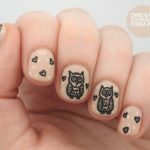 Today’s post is due to a combination of factors, but mainly because Amelia said she loved my owl nails and she said she’d also like something vintage-y so what better than vintage owls? Kind-of. To create these I painted my nails with a base of 2 coats OPI- Samoan Sand, I then painted a layer of an unnamed glitter and then another layer of Samoan Sand to create a ‘glitter sandwich’ effect. Then I lightly painted on the lines for the text and the owls in black acrylic paint with a small brush, and then went over them more solidly when they looked as I wished. Once dry I put a layer of Seche Vite and then a layer of Essie – Matte About You. I absolutely love these nails, they’re right up my street – If only i had a steady enough hand to paint like that on my nails! I also love Alice’s blog, it’s one of my favourite nail blogs and her designs always inspire me, make sure you go check her out! You can find Alice’s incredible blog over HERE and her Tumblr Blog HERE! 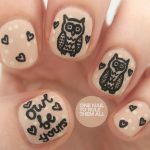 We’d love to hear what you think of these cutsey nails – tweet us @xameliax @onenailtorule #owlbeyours!